I want to take you in your mind’s eye away to Golgotha, the place of the skull, just outside the city walls of Jerusalem. Cruel Roman soldiers have taken the Sinless Son of God whose back they have lashed until it is like a bleeding ploughed field. He is in excruciating pain but they throw him down upon a wooden cross and nail His hands and feet to it. He does not resist. They offer Him vinegar mixed with gall to dull the pain. He refuses it. He would suffer all the pain. Oh, the agony as that cross was jolted into position! They, seemingly unconcerned, part His garments and cast lots for them. THEN they sit down and watch Him. Then, they saw Him bow His head and die. This was so unusual that He could hold His head upright until the end. At that moment there was a mighty earthquake. It struck great fear into the hearts of those hardened Roman soldiers as they sat there, causing the centurion to realize that this was no ordinary crucifixion. He recognized that this truly was the Son of God. BUT STOP! Stop and think! 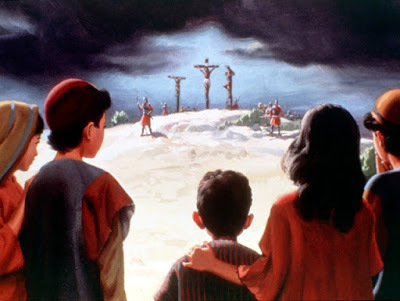 You are there at the cross…sitting…watching Jesus die. I’ve taken you there in your mind’s eye. Is your voice heard among those who mock the Saviour? Have you gambled like the soldiers with your God-given gifts and opportunities? Do you feel any sorrow as each drop of His precious life’s blood falls to the ground? Do you side with the mocking thief or the repentant thief? Does your heart go out to Mary as she watches her Son die in shame and it feels like a dagger has pierced through her own heart? How do you feel during those three hours of deep unnatural darkness in the middle of the day? Can you hear the groans as Jesus endures the agony of the wrath of God for your sin? Do you care that God the Father forsook Him when all your sin was laid upon Him? As you watch the One on the middle cross, can you see like the centurion that He is different? He truly is the Son of God. Remember, you will probably never experience an earthquake that will strike fear into your heart to make you get right with God. But will you like the penitent thief make Him Lord of your life?